View More In Mixer Parts & Accessories. Gvode Pasta Roller & Cutter Attachment turns your mixer into a professional Pasta Maker/ Noodles Machine. Can connect to KitchenAid Stand Mixer, to make authentic, fresh pastas quickly and easily at home. ~Pasta Roller easily roll 5.5-inch sheets of pasta with 8 thickness settings to adjust to your desired sheet thickness. 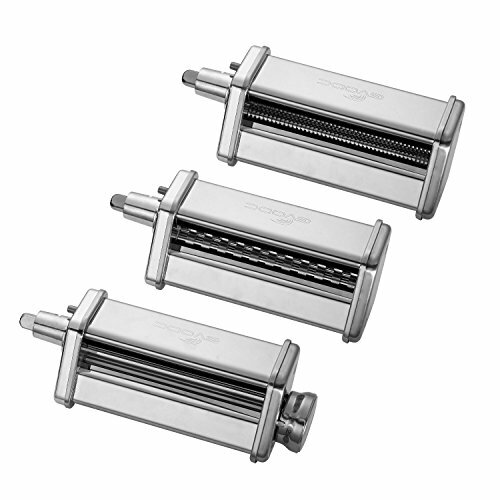 Food grade and High quality stainless steel components, including outer housing and inside axle-rollers, cutters / blades and gears. This item specially designed for KitchenAid Stand Mixer, all household models(It Not belong to the brand of Kitchenaid). It also can fit other stand mixers which has same front power outlet(attachment hub) as kitchen aid mixers, by slow-medium speed. For example it also compatible for Cuisinart stand mixers some models "Series": SM-50, SM-50BC, SM-50R. To protect product specially the precise gears inside, Do not Wash or Immerse in Water ! Also Not put into dishwasher! Clean by hand or cleaning brush, or dry soft cloth. Store them in a dry place at room temperature. Any question, please feel free to contact us! If you have any questions about this product by GVODE, contact us by completing and submitting the form below. If you are looking for a specif part number, please include it with your message.